Why are popsicles hard but ice cream is soft? Why can we use a spoon to eat ice cream, but even a knife can’t cut through ice? It can’t be the temperature; they both come from the same freezer! Qualities such as texture and hardness of desserts are determined by the materials they are made of and the process by which they are made. The materials used determine the type of atoms and the process determines how they are arranged. So, by changing the materials and process of desserts we can change the atomic structure of what we eat. These differing atomic structures can make some very different types of desserts! 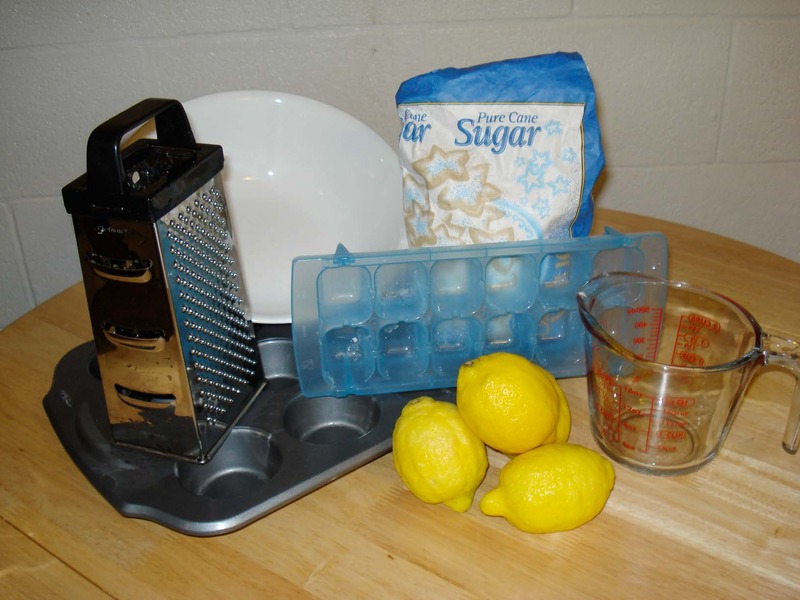 In this activity you will get to make Lemon Ices two different ways and test which ones you like the best. You will use the same materials for each type of Lemon Ice, but change the process to get a different dessert. By holding the materials constant, you will know that the differences in the final product are due to the different process. Use caution when heating sugar water and cutting the lemons. Mix the hot water and sugar; stirring until all of the sugar is dissolved. Put this mixture in the fridge for about one hour. During this time, prepare the other ingredients. To make the fresh squeezed lemon juice, cut the lemons in half and squeeze them over a measuring cup. Keep squeezing until no more juice comes out, then grab another lemon half and repeat until you have ½ cup of juice. Fish out the seeds from the lemon juice with a fork. Next, use a lemon zester or the side of a grater to grate lemon rind. Be sure to only grate the outer surface of the lemon; if you get down to the white part it will be bitter tasting! Add this lemon rind to the lemon juice. During this time you can also prepare your ice cube or muffin trays. Make sure they are clean and dry. You will have two groups of Lemon Ices, Type A and Type B. You can either use two different trays, one for Type A and the other for Type B. Or, you can use one tray and make one side of the tray Type A and the other side Type B. Whichever you choose, use the masking tape and pen to label the areas of the tray you will have as Type A and Type B. After an hour, remove the sugar water from the fridge and add the lemon mixture to it. This mixture is the material that will be used for both types of Lemon Ices. Pour the mixture into the ice cubes or muffin tray distributing evenly. Save any leftover mixture in the fridge for further experiments! Put the tray in the freezer and wait. After 30 minutes, remove the tray and observe what has happened. Has anything changed? Use the spoon to stir each of the Lemon Ices in the Type A section. Make sure to scrape along the sides of each Lemon Ice as you stir. Do not touch Type B. As soon as you are done stirring, place the tray back into the freezer for 30 minutes. Continue stirring Type A every 30 minutes for approximately 3 hours, or until both Types are frozen. Be sure to make observations each time you take the tray out. When do the Ices start to become solid? What changes occur? Which Type changes first? Remove the trays and make your final observations. What is the consistency of each Lemon Ice? Use a spoon to try the Type A Lemon Ices. Can you use a spoon on Type B? You may have to twist the trays to remove the Type B Lemon Ices. What happened? When water is in its liquid form, the molecules are free to move around. When water freezes the water molecules settle into a rigid structure. If we stir the water molecules throughout this freezing process we can change how the molecules are arranged in the atomic structure. Even though we can’t see the different atomic structures because atoms are so small, we can experience some of the effects they cause, such as different textures of Lemon Ices! Repeat the activity with more variables. What happens if you stir every 15 minutes? Every hour? Use toothpicks or popsicles sticks to make the Type B Lemon Ices into popsicles! Experiment with other flavors of popsicles. Can you make Strawberry Ices? Hunt for some recipes online, but try changing the freezing process slightly and see what the outcome is! Changing the process of making Lemon Ices makes two completely different consistencies of dessert! Even though we used the exact same materials (water, sugar, lemon juice, lemon rind), the two types of Lemon Ices turned out much different because of the processes we used. Similarly, when scientists make things in their lab they may use one combination of materials and try hundreds of different processes to get different end results.